Here is a quick review of the events that have happened so far with the preparation and restoration of Union Pacific 4014 before its journey to Cheyenne, WY. These pictures have been provided by David Dodds and have been used his with his permission. Ed Dickens and crew meet the press on November 14, 2013. A steam crew member prepares 4014 on the grounds of the Rail Giants Train Museum at Pamona, CA for the move to West Colton, CA. 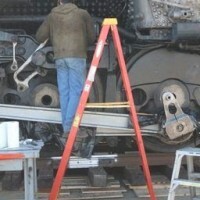 Much of the work to get 4014 ready is in hard-to-reach places. Track panels are built in preparation of moving 4014 from where it has been on display for over 50 years to the edge of the Los Angeles County Fairgrounds. Track panels are assembled in preparation of moving 4014. The 4014 is slowly pulled in reverse on moveable track panels. This is the beast that was used to move 4014 across the Fairgrounds. This is how they pulled the 4014. The 4014 is parked as far as it can go before the move to West Colton. You can see a MetroLink train off to the far left. 4014 is ready on the morning of the move. UP 1996 couples on to the tender of UP 4014. UP 4884 leads 4014, 1996, and a string of covered hoppers to West Colton. 4884 will also be involved with the move to Cheyenne, WY. A three-quarters view of 4014 on the road to West Colton. A side-view of 4014 showing all the hoses added to ensure a safe trip. The crew of the 4014 overseeing the move. A going-away shot of the move. There were a lot of people along the tracks as witnessed with this shot. For 4014, The Rail Giants Museum received locomotive UP 3105, a former Missouri Pacific SD-40-2. They also received UP caboose 24567, a former Rock Island caboose, and a box car. Here is UP 3105 arriving at the Los Angles Fairplex.